Meticulous Selmer Maccaferri replica built by Jean Barault. Used in the 2017 film Django! No detail was overlooked in the construction of this guitar. Hardware, label, headstock logo, woods, bracing, binding, etc are all indistinguishable from the originals. The guitar features Brazilian rosewood back and sides, spruce top, and a walnut neck. 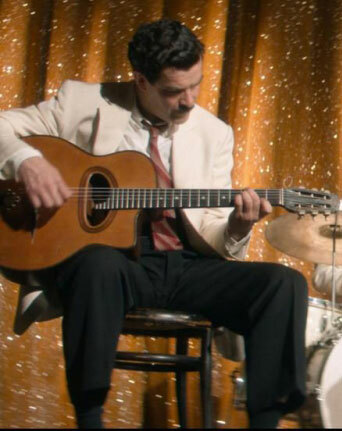 As you'd expect, top was constructed using heat bending method originally employed by Selmer (most Gypsy guitars today have force bent tops which results in a different type of bend and sound.) This guitar was also skillfully antiqued to give it the look and feel of 1930s era Selmer. In accordance with Maccaferri's original design, this instrument includes an internal resonator which enhances the tone and projection of the guitar. Jean in no newcomer to building exacting replicas of Selmer guitars. In honor of Django's 100th birthday (January 23, 2010) the Selmer corporation had the idea to reissue 10 more Selmer guitars. They approached one of the most accomplished luthiers in France and had him build two prototypes. The first one, #881, is now owned by Bireli Lagrene. The second prototype (#943) was sold by us years ago. Selmer was very impressed with these replicas but in the end decided it was too much trouble to get back into the guitar business after all these years. Here's a chance to own a piece of history at the fraction of the price that vintage Selmers go for! With vintage Maccaferris fetching prices around $50K, this meticulous replica offers the opportunity to own something with some old world charm for far less than the originals.